Empathy is often quoted as being one of the key absorbed skills from reading. And this new picture book screams it from the rooftops. The viewpoints and feelings of other people goes to the heart of books and why we read them – Anthony Browne was a trailblazer in picture books for illustrating different points of view, but this book treads a different path. The reader is taken on a walk with a cat. But instead of seeing the world from the cat’s point of view, each page shows how the cat is seen by each creature it meets. The child’s view of the cat is rather different from the dog’s, and hugely different from the mouse’s and the flea’s views. This beautiful originality of concept and illustration allows the reader to really understand perception, and visual storytelling – seeing the subjective nature of how we view things – how everyone’s idea of the physical world is slightly different. 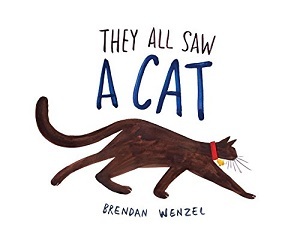 The author illustrator Brendan Wenzel says that he conceived the idea while teaching art – for example if all the students in a class drew a cat, they would all have seen and imagined it differently – and this book takes things one step further. The artwork is startling. The mouse’s perception of the cat is exemplary – like a nightmarish version of an artwork of menace and threat with a red background resembling blood, and the claws and teeth illuminated in white. The edges are sharp – there are black triangles on the background as if radiating the cat’s aggression, and big yellow eyes – in contrast to the shivering timidity and fear of the furry mouse. Empathy is evoked immediately. Wenzel even introduces science in his depiction of the bee’s eye view of the cat. It’s pixelated – representing the insect’s compound eye (hundreds of single eyes all arranged next to each other with their own lenses looking in their own direction) but adding up to one large image. The spots create a slightly blurry image of the cat against a pixelated spotted background. The only fully defined illustration is that of the bee (the reader’s eye view). A host of media, colour and texture has been used to portray the different perspectives but continuity and pacing is provided by the text, which is equally skilful. With a repetition and rhythm that doesn’t get in the way of the visuals, but instead, pulls the reader through the book. Wenzel uses italics and capitalisation for emphasis in the minimalistic text, and there are natural pauses to allow the reader to absorb what each animals sees. Even the ending is well conceived – a reflection gives the cat a chance to see itself – and leaves the reader with plenty to discuss – the visions of self, the perceptions of others. And despite all this ‘reflection’, there is an innate calmness to the book as well, a feeling that the book is based in nature – with plentiful greens – trees and fields. The style is slightly reminiscent of Eric Carle with its swirls of colour, and as with The Very Hungry Caterpillar, We All Saw a Cat is a picture book that suits all ages and should last throughout the years. You can purchase it here.